Happy Friday, everyone! No new release for Amber this week, but check out the sneak peek for next week. Ooh, I can not wait for this one!! Well, this beautiful new kit isn't quite ready yet, but in the meantime, don't forget that there is a great sale on at Amber's shop at the Studio. Go grab something else beautiful while you wait! 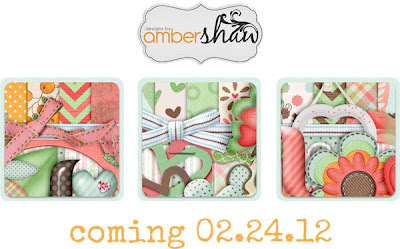 And finally, don't forget to "LIKE" Designs by Amber Shaw, so you can get this Facebook Exclusive kit. Isn't it fabulous?